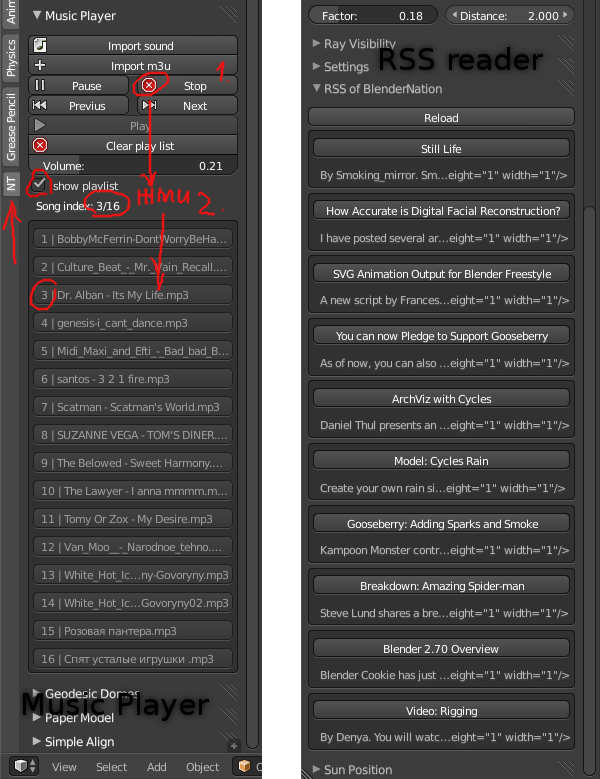 With these two new add-ons, you can now listen to your MP3's or read RSS feeds (including BlenderNation! ;-) from inside Blender! Between developing Sverchok, F2, QQads (coming soon from Alexander Nedovizin), blender-addons developers relaxing by trying to make Operating System's shell from blender. First came RSS feed reader, that made by Nikolay Fomichev. It is 2.5 blender addon, old one. Situated in World properties. 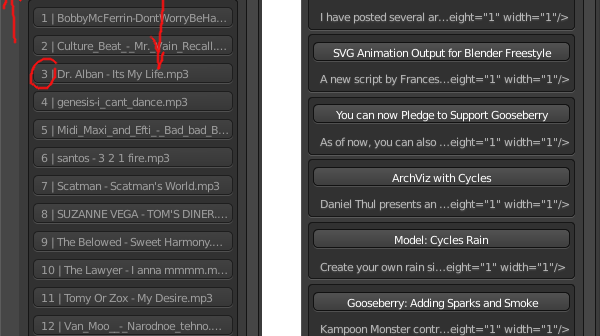 Second is a music player for Blender, made by edddy and some developed by nikitron. Situated in 3D toolshelf in NT tab. Other than possibly just for fun, what is the purpose of this? That is what I thought as reading this entry. When I've wrote MusicPlayer, it was to learn Python and I've diffused it on Blender Artists under the title "useless addon"
Ho cool, my old addon Music Player! next, the a mobile game engine, to make pretty apps and games and include all of these nice features. i see mistake in description - RSS reader in world properies Area, and music player in properties 3d toolshelf in NT tab. We need a Blender theme song. As much as this is fantastic programming, and I commend the person(s) who wrote it, and it certainly is an excellent demonstration of the flexibility of Blender, I can't help but feel this is more of a distraction than a useful addon. There are certainly applications out there to play music or read RSS feeds, it's not like it's an essential feature for an applications like Blender. It does have a cool factor to it of course but aside from that, not much else. What would be more useful is addons that help in the creation of assets or scenes, or help in automating certain repetitive tasks. But again, hats off to the creators, I certainly couldn't do this! We need this type of addons for python beginners. For example, I learned some from this music player, as you did. Maybe this addons themselves not usefull. But if you i.e. link php website and blender scene, you may be interested in rss reader. Or if you connect music player with 3D object with 3d scene this could help. Somehow this doodads become usefull or as good examples to understand python. Your assumption here is that if these guys hadn't made these add ons, they would have built the stuff you would like to see. Open Source communities don't work that way - people do their own crazy experiments or 'scratch their own itch'. I dare to push to github.